ComiXology, Amazon’s premier digital comic shopping and reading service, revealed their 2017 New York Comic-Con plans today, with a fan-centric Comic Book All Star Trading Cards photo booth that let’s comic fans take pictures with their favorite creators, sponsoring Artist Alley and topping it all off with a 10th Anniversary Party on Friday open to all. 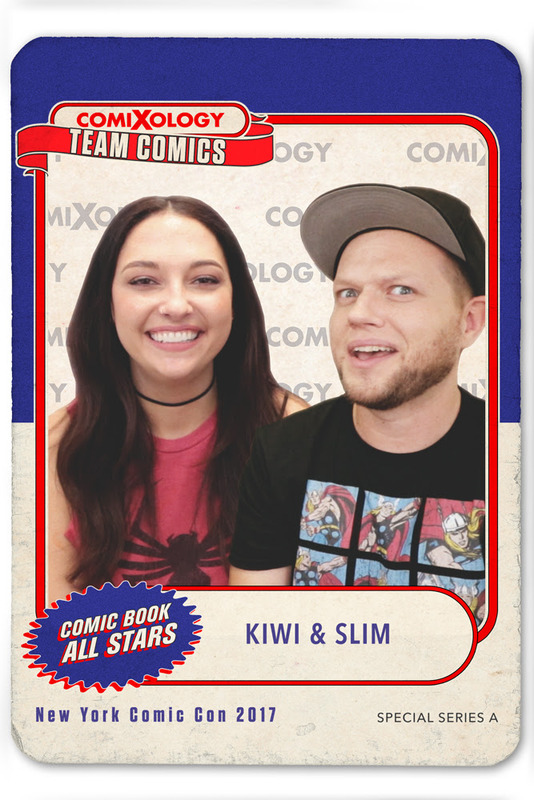 Placing the spotlight on fans, comiXology is putting a twist on their popular trading card promotion with this year’s Comic Book All Star photo booth. Fans now have the opportunity to get their photo taken with their favorite comic book creators during specified times, or take a solo photo all weekend long, and join #TeamComics. Whether posing with creators, solo, or with a friend, this photo opportunity is a celebration of comics culture. Participants will receive a print of the photo and also their card digitally to share via social media. On Friday October 6th, comiXology invites all fans and professionals to come celebrate at its 10th Anniversary Party. The party kicks off at 9pm at Tir na nÓg, 315 West 39th St., New York, NY 10018 and goes on until midnight with an open bar and appetizers (first come first served). New York Comic Con takes place in New York City October 5th – 8th at the Javits Convention Center with comiXology exhibiting at booth AAB1 in comiXology sponsored Artists Alley, found in it’s new location, Hall 1E. In addition, comiXology will be hosting three panels at this year’s convention with fun giveaways at each panel. The company will be announcing the schedule for creator photo opps via comiXology’s social media and Tumblr closer to the convention. The Comic Book All Stars Collectible Trading Cards were made popular with Comic Book All Stars Series 1, a set of 26 cards that were given away in July 2016 at Comic-Con International in San Diego, Series 2, a set of 31 cards given away in October 2016 at New York Comic-Con, and Series 3, a set of 35 cards given away in July 2017 at Comic-Con International in San Diego.